Yoshi's Story in Super Smash Bros. Ultimate and Melee. Announced at E3 2001, Yoshi's Story (ヨッシーストーリー, Yoshi Story) is a stage in Super Smash Bros. Melee and Super Smash Bros. Ultimate. It is one of Yoshi's home stages, and in Melee, he is faced here in All-Star Mode. Yoshi's Story is a very basic, neutral stage, similar in structure to Battlefield. The bottom part is primarily flat with the left and right side sloped down at a minor angle. There are three platforms that float above the bottom platform: A low left one, a high middle one, and a low right one. 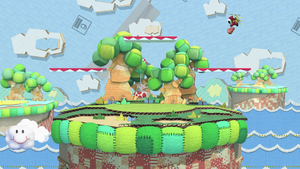 The main platform has walls which continue to the bottom of the stage, unlike Battlefield, so that characters cannot become stuck on the bottom trying to recover. Yoshi's Story's blast lines are much closer to the stage than in other tournament legal stages, meaning that KOs occur more easily. The stage also features a small floating cloud, colloquially dubbed "Randall" (see below). Additionally, there are Shy Guys which fly around in groups of 1-6 in a line. If items are enabled, specifically food, the Shy Guys will be holding food which they release onto the stage when hit. Even when food is not present, Shy Guys can affect gameplay: they will interfere with projectiles, and moves such as Green Missile and Raptor Boost, and they are useful for countering stale-move negation, through hitting them with attacks not commonly used. In Ultimate, the Shy Guys always carry food regardless of item settings. However, with hazards toggled to “off”, the Shy Guys, as well as the cloud, do not appear. Pak E. Derm can be seen pacing back and forth in the background. Randall the Cloud is a nickname for the cloud featured on this stage. It moves in a rectangle through the bottom of the stage. It is possible to stand/edgeguard on the cloud until it goes back into the stage. It is often used to assist the recovery process. The term derived originally from Canadian smasher FastFox, and it has since taken off as a norm on SmashBoards. It is also mentioned commonly in competitive Melee matches, usually when a player chooses to land on it instead of aiming for the edge while recovering, or when it comes out and saves a recovering player who otherwise would've been edgehogged. Randall does not appear for the opening ten seconds of a given battle and emerges on the right-hand side of Yoshi's Story immediately thereafter, completing a trip through the stage and out the other side in 20 seconds. This means that the position of the cloud is consistent and predictable, not random. Through paying particular attention to the countdown in a timed match, a prudent smasher can use this knowledge to effectively stall a recovery and land on Randall instead of falling. CPU opponents tend to try to recover to Randall if possible, leaving them susceptible to gimps. Randall the Cloud can also be used for taunt canceling. In Super Smash Bros. Ultimate, the Ω form and Battlefield form are similar to the layout of the normal form of this stage; however, the main platform is completely flat, and both the main platform and the three soft platforms have been resized to match Final Destination and Battlefield, respectively. The main platform no longer extends below the blast line, but is now suspended in the air. The cloud is also absent. This stage is based on Yoshi's Story, in which Baby Bowser turns Yoshi's Island into a storybook and steals the Super Happy Tree. This causes the environment to be turned into various materials such as cardboard, yarn, and fabric. This stage is an amalgamation of the cardboard theme of the first level (Treasure Hunt), and the fabric and cloth theme of the second and third levels (Surprise!! and Rail Lift, respectively). The cloud is also from Rail Lift, where Yoshi must navigate on clouds that move on yarn rails. In Yoshi's Story, Pak E. Derm occasionally prevents Yoshi from proceeding, but can be stunned with a Ground Pound. He can be seen wandering in the background of this stage. Also in Yoshi's Story are Propeller Shy Guys who hold fruit while flying around, which Yoshi can eat before they fly away. In this stage, Propeller Shy Guys carry fruit and will drop it after being attacked. Treasure Hunt in Yoshi's Story. Rail Lift in Yoshi's Story. Note the cloud on a rail. The lack of intrusive stage elements aside from the moving cloud and the Shy Guys makes this a neutral stage for tournaments. This stage is often cited as one of Marth's best stages, due to its smaller size and platform height complementing his disjointed hitboxes and long range. This stage is also often regarded as one of Fox's best stages because of its small blast zones, which can KO an enemy with an up-smash or up throw to up-air at exceedingly low percents. This stage has been downgraded into a counterpick stage, or sometimes even outright banned. This is due to the slight slopes that are on the edges of the stage, as well as its similarity to Battlefield. Although the Shy Guys carry food even with the items turned off, turning hazards off removes the Shy Guys and Randall the cloud, making most tournaments prefer this version of the stage. Bayonetta crouching near a Mr. Saturn on the stage. Dark Pit unleashing his Final Smash, Dark Pit Staff, on the stage. Ness striking Bowser Jr. with Death's Scythe on the stage. Fox dashing behind Krystal on the stage. Mr. Game & Watch knocking away King Dedede and Sheik on the stage. Richter in his red alternate costume on the stage. In Super Smash Bros. Ultimate, Yoshi's Story is not used for any character's Classic Mode route in any form.